'There are no safe paths in this part of the world. Remember you are over the Edge of the Wild now, and in for all sorts of fun wherever you go." A failed robbery, the daring of two Hobbit brothers, a terrible crime, the flight of the Elves, the affairs of Wizards, black treachery, an ancient threat - seven stories to be told in the Twilight of the Third Age. Seven adventurers need a company of heroes to undertake them. 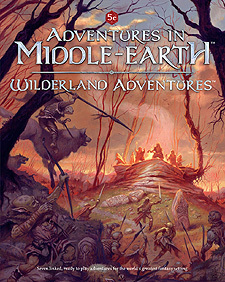 Wilderland Adventurers contains seven ready-to-play adventures, complete scenarios that can be played separately, or as an epic campaign spanning across a number of years. All adventures are set in the years after 2946, and take place in Wilderland. Will you dare enter the great forest of Mirkwood, journey under the shadow of the Misty Mountains, visit the house of Beorn, follow the River Anduin down to the Galdden Fields, or climb the Grey Mountains to look upon the Withered Heath?